The executive branch of government is the branch which suggests new laws and taxes and puts them into effect. 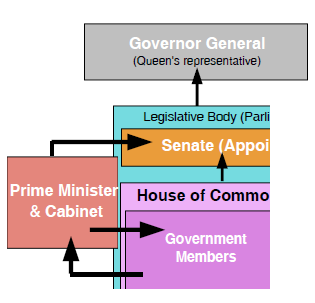 cabinet: a group of advisors chosen by the Prime Minister from the majority party in the House of Commons.Cabinet because, as elected representatives, they have the support of the people. The Governor General: the representative of the monarch (crown), appointed on the advice of the Prime Minister for a term of five years.Governor General, now mostly a symbolic figurehead, is also part of the executive, granting royal approval to the recommendations of the Prime Minister.